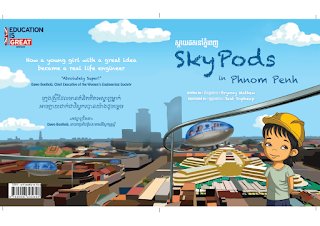 “Sky Pods in Phnom Penh” tells the story of how a young Cambodian girl comes up with inventions to help her to finish her household chores so that she can spend more time reading books which is what she loves doing best. She searches through her house to find pieces of junk and then measures and fastens and assembles the parts to make a marvelous machine that helps her to feed the chickens, water the garden and sweep the floor. Her mum and her teacher are amazed by what she has achieved and tell her that she’s a little engineer. When she grows up she moves to Phnom Penh and becomes a real engineer who designs the new transport: super fast tuktuks and pods that take flight – Sky Pods in Phnom Penh! The book is bilingual English/Khmer and is written in rhyming style. It is aimed at children in the 5-10 year age range. The book was written by British Deputy Ambassador, Dr Bryony Mathew, and was published by Sipar. The illustrations are by Mr Seat Sopheap.